Please download and complete the form below and bring it along on the day. This provides us with important information regarding any medical conditions your child has and how you may be contacted in the event of an emergency. 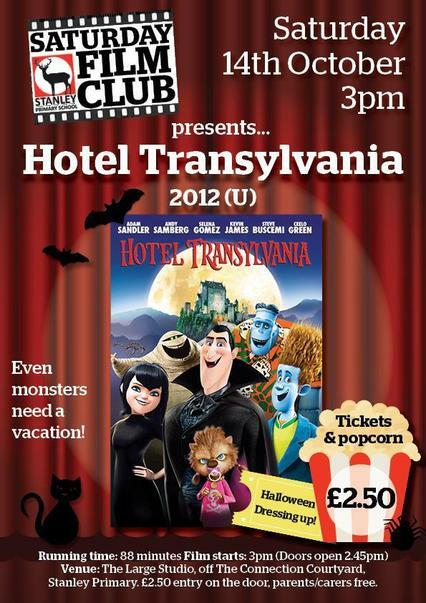 Filmclub is back for a special Halloween screening of the hugely popular Hotel Transylvania. Our Ghoulish Filmclub goers are invited to dress up for this ghastly screening there will be lots of frighteningly delicious popcorn. Please note that Year 3 upwards can watch the film unaccompanied but that Parents of Year 2 children down have to be accompanied by an adult (there is no charge for accompanying adults). Having an over-protective parent is one thing, but can you imagine if your dad also happened to be Dracula? Welcome to Mavis's world - namely the Hotel Transylvania, which her father created as a sanctuary for ordinary, decent monsters and ghouls, safe from that most ghastly of creatures: the human being. At the tender age of 118, Mavis begins to get itchy feet and longs to see the outside world, much to Dracula's distress. To make things even more complicated, a dippy human turns up at the hotel and falls in love with her. Stanley Primary School's Saturday Film Club was set up several years ago by a group of parents with the aim of showing films that children may not have seen on the usual cinema circuit, as well as providing the opportunity to view some great film classics. Supported by the British Film Institute and its dedicated 'FILM CLUB' charity, this initiative is driven by parents who love children's cinema and give up their spare time to organise each film club session as part of the Friends of Stanley Primary (FOSP) activities. Visit the official site for further details and news of what's happening at FILM CLUB http://www.filmclub.org/. - feedback on Film Club - what do you like, dislike, what would make it better? Please contact Film Club coordinators: Emily Bussell, Fiona Helyer and Kelly Atkinson at mail@stanleyfosp.co.uk or leave a message at the school office. Please note that children in Year 3 up are permitted to watch the films unaccompanied, but that children from Year 2 down have to be accompanied by an adult. Thank you. Entrance is £2.50 per child and free of charge for accompanying adults. Please come along - all profits go straight back to the school!